The Anglo-Saxons came to Staffordshire in the 6th century and it is believed there was a royal palace, close to St. Editha’s Church. Charters show Mercian Royal families stayed there far more than other palaces and were regularly here for Christmas and Easter. Mercia continues to herald its importance with the discovery of the Staffordshire Hoard, which appears to date from around 590 A.D. to 750 A.D.
Six wealthy influential families have owned Tamworth castle and had royal visits from King Henry II, Edward III, James I and his son Prince Charles. St Editha’s is believed to have been built under the guidance of Robert de Marmion, the King's Champion and Lord of Tamworth Castle. It's rare double spiral staircase and unique stained glass window were designed by world-renowned pre- Raphaelite Sir Edward Burne-Jones. Built in 1701 and funded by Thomas Guy, it originally had a single room supported by 18 Tuscan style stone pillars. An exterior staircase also served as a platform for public events and announcements. In 1771 two rooms were added and these were replaced by larger rooms partly funded by Sir Robert Peel. The area beneath the hall served as the Butter Market and later housed the town’s first fire engine. The turret in the centre of the roof was a later addition and the domed cupola with the weathervane housed a lantern and contained a bell to summon firemen. The clock was presented to the town by the then owner of Tamworth Castle, John Robbins, in 1812. It is open to the public during the National Heritage Open Day event. Built in 1678 and funded by Thomas Guy, the Almshouses originally provided housing for seven poor women. In 1692 the Almshouses were extended to allow men to live there. The original Almshouses were demolished in 1912. They were rebuilt on the same site in the ‘Free Georgian’ architectural style of the original. After being rejected as MP in 1708, Guy banned the residents of Tamworth from the Almshouses. Residents were restricted to his own relatives and people living in outlying villages. This restriction is still in place today, with the stone plaque above the main entrance reading ‘Guy’s Almshouses for relations and Hamleteers’. This 16th century building was once the home of the Comberford family. 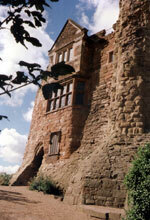 Prince Charles visited in 1619 while his father King James I stayed at Tamworth Castle. 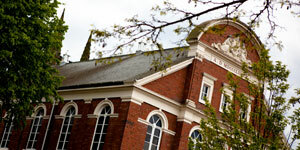 In 1815 the building was the venue for a lunatic asylum. It is now a public house and restaurant. Born on 5 February 1788 Bury in Lancashire, he was the eldest son born to Robert Peel (the first Baronet) and Ellen Yates. In 1798 the family moved to Drayton Manor. Sir Robert Peel attended Harrow and was then admitted as a gentleman-commoner to Christ Church Oxford, where he was awarded a double First in Mathematics and Physics in 1808. He began a career in law but later moved into his parliamentary career. He was twice Prime Minister, in 1834-35 and again in 1841-46. Best remembered for his ‘Tamworth Manifesto’, the Corn Laws and the Repeal Act and as the founder of the modern Police Force in 1829. Police are still affectionately called ‘Bobbies’. Peel has been seen as both the founder and betrayer of the Conservative Party and the real founder of the Liberal Party. He died in 1850 following a fall from his horse on Constitution Hill, London. He is buried at the small parish church at Drayton. Born in 1644 in south-east London, his father was a lighterman, coalmonger and carpenter. His mother originated from Tamworth. 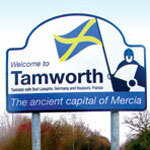 Following his father's death in 1652, the family returned to Tamworth. Guy was educated at Tamworth’s Free Grammar School, Lower Gungate. At the age of 16, he was apprenticed as a bookbinder in London. Guy set up as a successful bookseller and publisher and in 1677 paid for the refurbishment of Tamworth’s Free Grammar School. 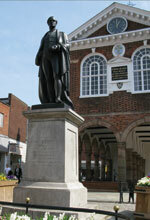 In 1678 he built the Almshouses and funded the building of the Town Hall in 1701. Elected to parliament in 1695, he served as MP until 1707. When Tamworth people failed to re-elect him, he threatened to demolish the Town Hall and banned Tamworth people from his Almshouses. Rejecting Tamworth, he turned his attention back to London where he personally financed the building of Guy’s Hospital, Southwark in 1722. Guy died at home on December 27, 1724 after visiting the building site. He never got to see the project completed and left his fortune to Guy’s Hospital. The sister of Athelstan married the King of Northumbria, in 925. Sihtric soon broke his Christian vows and relapsed into paganism, deserting Editha. War continued and was ended temporarily upon the death of Sihtric a year later, Editha retired into a convent she founded close to the Palace where she had reigned as bride. Able Seaman Colin Grazier's actions shortened the Second World War by up to two years. When serving on HMS Petard in October 1942, he and fellow seaman Lt Anthony Fasson died retrieving vital German codebooks from a sinking U-boat. Third sailor, Tommy Brown, survived but died in a house fire while still a teenager. It was the precious documents they seized which enabled Bletchley Park’s code breakers to crack the Enigma codes. Now recognised as a pivotal moment in world history, the mission was cloaked in secrecy for decades. Not even their families could be told they had paved the way for peace. Colin Grazier was born in Tamworth and married only days before he left to go to sea. A memorial to the bravery of the three seamen now stands in St Editha’s Square. 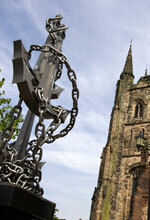 Check out our Heritage Trail for many more historical points of interest in and around Tamworth.